Product placement becomes marketing magic when a brand’s product is seen in a scene in a scene-stealing way. Over the last 10 years, product placement has become so prevalent that it’s rare to watch a TV show or movie without spotting some brands in the background. With so many products vying for close-ups, AdAge.com reviewed the last decade in popular entertainment to spot the brands placed so right that they literally stole the spotlight. 1. AT&T with “American Idol,” 2002 to 2013 – AT&T actually made the singing show possible by providing the means for viewers to vote for contestants. The fact that AT&T abruptly ended their partnership this year was a signal that it may be time for the curtain to come down. 2. Pontiac on “The Oprah Winfrey Show,” 2004 – When Oprah launched her show’s 13th season by giving Pontiac cars to all 276 audience members, the media went into overdrive about the generous gift. Pontiac did donate the cars and covered the sales tax, but all of priceless publicity made it money well spent. 3. Staples with “The Office,” 2006 – The big-box store was a perfect fit for the small-screen workplace comedy. And the storyline actually led the store to name a line of paper after the company on the show. 4. GM in “Transformers,” 2007 – The film franchise used GM cars as major characters in the original blockbuster and all three sequels. GM never paid for placement, but it did give the director two custom Camaros. 5. Harley Davidson on “Sons of Anarchy,” 2008 to present – When the FX hit about a motorcycle club was gearing up for production, producers sped to Harley-Davidson to ask them to sponsor the show. The company was worried about content but supported the spirit of the show, so they suggested having the bikers ride Harleys and then donated bikes in lieu of payment. 6. American Airlines with “Up in the Air,” 2009 – This best picture- winning film featured George Clooney as a corporate traveler whose goal was to fly 10 million miles on the airline and get his name placed on a plane. The airline took a starring role, but only provided locations and branding and didn’t pay for placement. 7. Subway in “Chuck” and “Community,” 2009-2014 – The sandwich chain took a fresh approach to product placement by being over the top instead of in the background. Their presence was very tongue-in-cheek and kept viewers munching on Subway. 8. Apple iPad on “Modern Family,” 2010 – Some product placements occur through coincidence rather than cash. That was the case for Apple when this popular program’s geeky dad became obsessed over getting his hands on the cool handheld gadget. 9. Procter & Gamble and Walmart in “Secrets of the Mountain” and “The Jensen Project,” 2010 – These made-for-TV movies were made to appeal to families, so they were right in tune with the target market who watched these shows and bought those brands. 10. 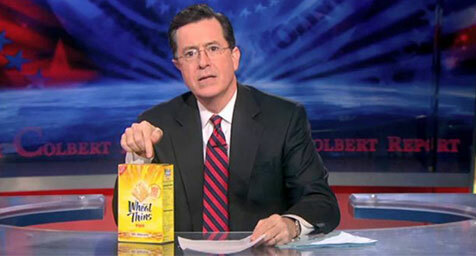 Wheat Thins on “The Colbert Report,” 2012 – Stephen Colbert cracked up audiences over the crackers when he read its ambitious branding brief that described the sponsoring snack as a means for shared experiences and a cracker that connects like-minded people. Everyone laughed at the lofty description and Kraft laughed all the way to the bank. Tune in to the latest in media. Contact MDG Advertising today at 561-338-7797 or visit mdgadvertising.com.